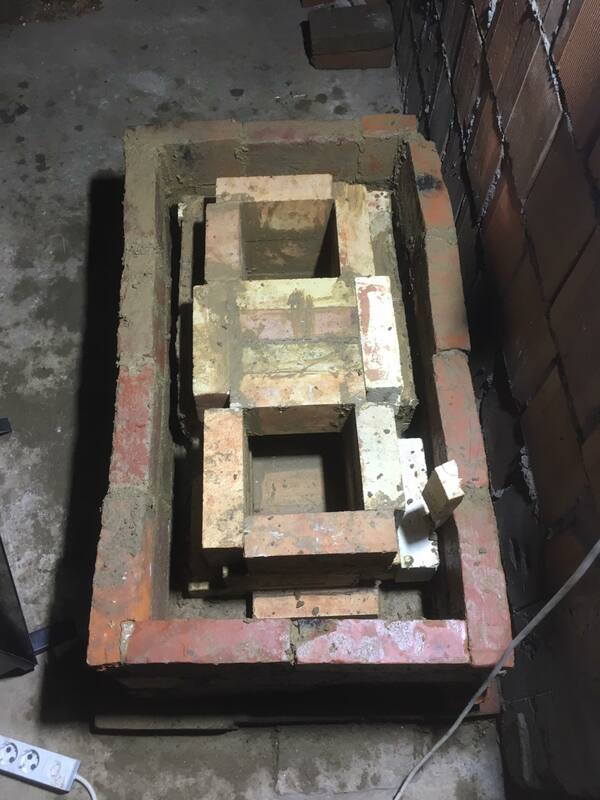 Building a rocket stove, why? For so many reasons this is revolutionary creation! Most of people I’ve met that did not know about RMH got seduced really fast… So did I! Actually, at the beginning it’s quite hard to believe that this metal barrel, and this soil bench can heat, and heat really efficiently. I’m Alex, a Service Civique volunteer in GAIA Kosovo, most precisely in Bozevce village situated in the South-East part of the country. In this place we are trying to implement our Permaculture Design, which also means energy efficiency (Use and value renewable source and services). It was not even a question not to build a rocket stove here. A Rocket Stove Mass Heater is a stove, yes, but it has some differences with most of the stoves you know. In most of cases it is shaped with vertical fireplace, a barrel and then a cob (mixture of sand, clay and straw) bench. Sounds crazy? Not that much actually. Natural building, in all its aspects makes senses, it’s inspired by traditional knowledge and the good aspects of nowadays technical explosion. 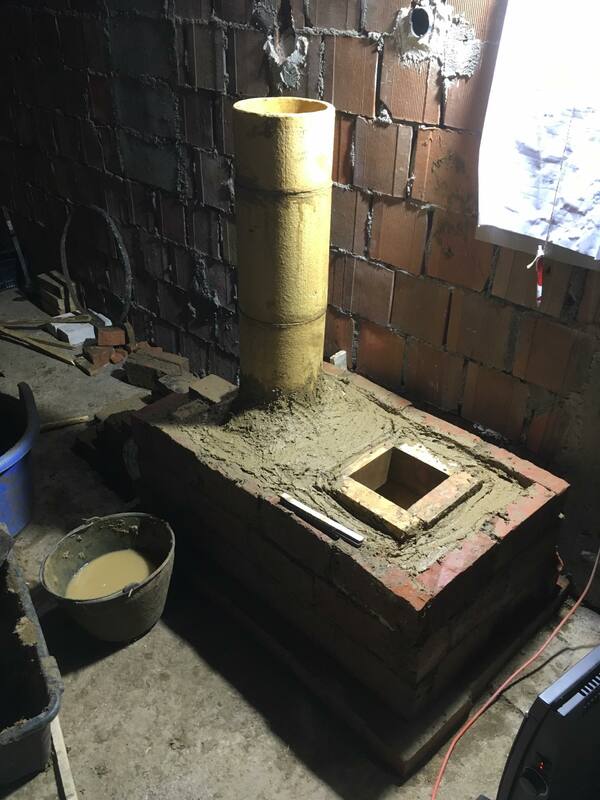 The principle of the rocket stove itself is logical: people generally insulate their chimney to avoid a deposit a creosote (non combusted waste that can create chimney fire). The change with RMH is that the fireplace itself is insulated, so the fire reach higher temperatures (1000°C) than a standard fireplace or stove. It then increases the amount of combustion (98% for RMH against 60% for most a wood heating systems) and burns out the creosote. To create a sufficient draft for the chimney you need this vertical part that is in the barrel. It creates such a strong draft that the fire can burn horizontally without pushing smoke back, also it makes a purring noise, and this is the reason why it’s called “rocket”. This is the rocket stove itself. The heat is first released out of the metal barrel, which induces a lot of conduction and of course then a lot of heat, that radiates out. The mass heater, also called Thermal battery is actually the chimney, which is not insulated, and it just wanders inside the house, in the place you want to heat, either as a bench, or a bed or a wall. Possibilities are multiple. Then Heater in understandable, but why mass ? 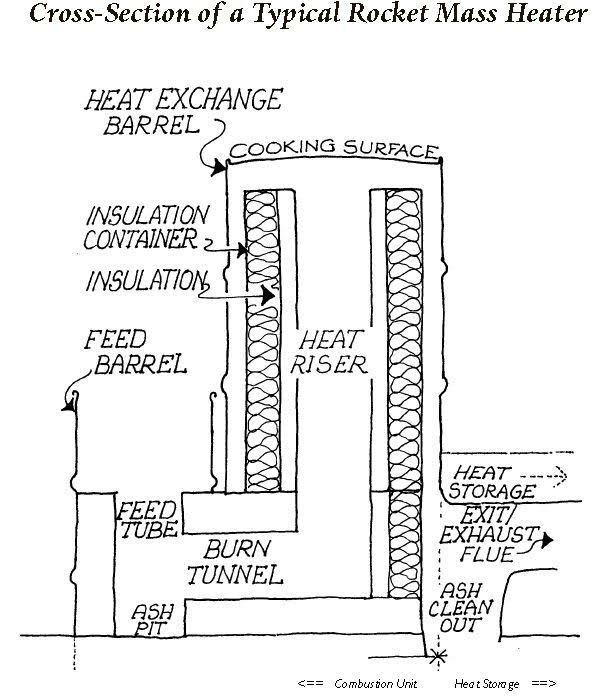 The mass stores energy, so the more mass you have around your chimney, the more heat you can collect and release. Heat travels slowly through the cob that is shaping your thermal battery, and is spreading even after your fire stopped burning, what considerably reduces the amount of wood you burn every winter. Disadvantages? 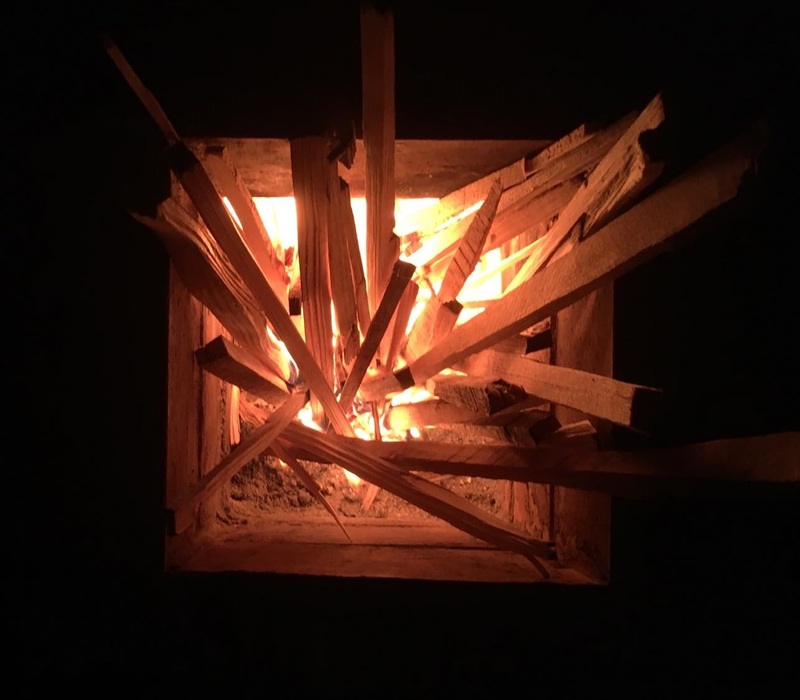 I still did not find any, even though it takes space, you can still find a way (check Pero’s page to see how great a rocket stove can look) to make it fit any kind of space. 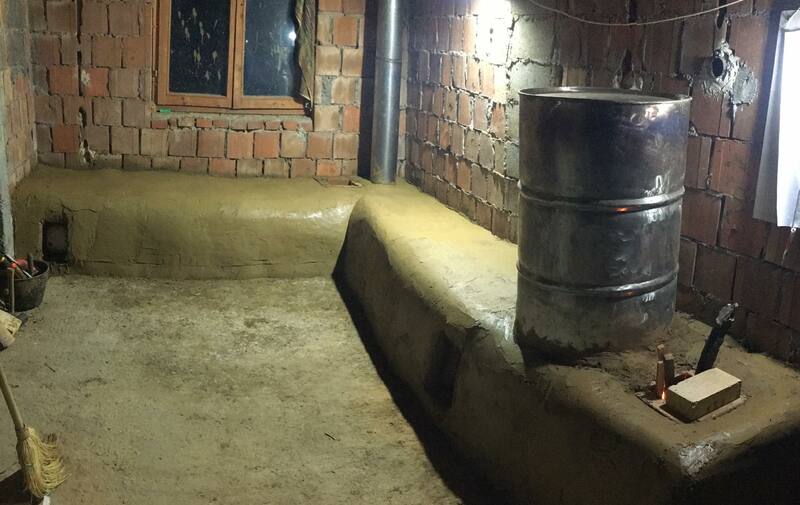 Now that rocket stove is a bit more clear, I can explain to you how building the RMH of Bozevce (which also appeared to be the first RMH in Kosovo!) happened. It’s end of October, weather is getting colder and we almost finished covering our lovely red house (red brick house) with straw and then cob to insulate it against cold in winter and heat in summer! But to prevent a house from freezing, it is also good and convenient to use a heating system, wood heating system there. It’s about time to build that RMH! DAY 1: After looking up on internet and agreeing on the place where we’ll build the RMH, we could start to buy materials. We went to buy stove pipes, for the tunnel. Instead of using concrete we’ll fix everything together with clay and sand mix (called mortar), it has the same proprieties as concrete but it’s a natural fixer! 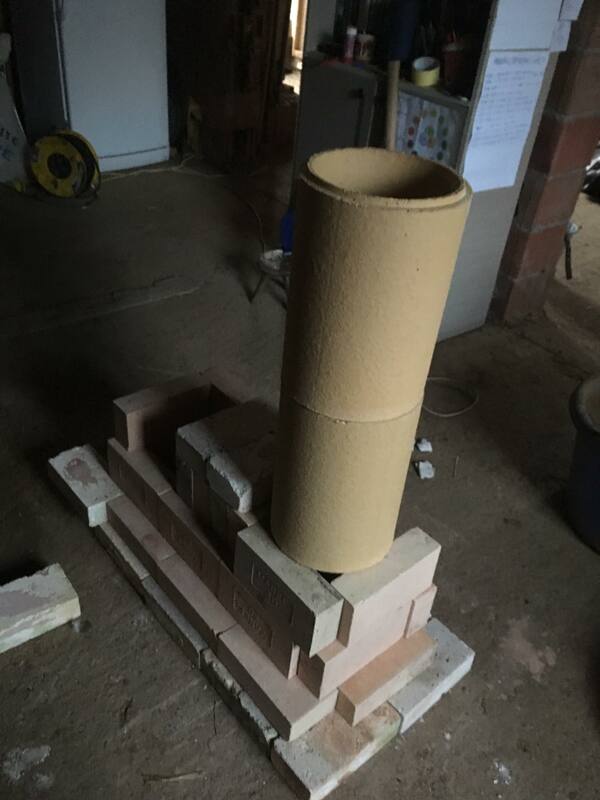 Before building a rocket stove it is always good to make a mock up outside, we realized that the bricks we already had were not really straight, but good enough to build the combustion chamber (fireplace + barrel). Because of not enough documentation we ended up using those bricks, building the first part of the rocket stove on a wrong foundation with what I can call now bad bricks… Also everything you will do on the rocket stove where the smoke goes, has to respect a certain cross section area, otherwise you will create a bottle neck, which will slow down the flow of the smoke and most likely push back smoke in your house with a back-draft! This was also our mistake, our stove pipes were 12cm diameter, which is too small to have a great draft… Thanks to Bruno Motik (Permaculture teacher from Zmag Croatia ) and then Pero (Whose Facebook page full of crazy nice rocket stoves he built: Raketne Masivne Peci – RMH Croatia ) of whom I will not mention how many times he helped us, without them this rocket stove would not be what it is, we avoided doing more useless work and we were back to point 0. 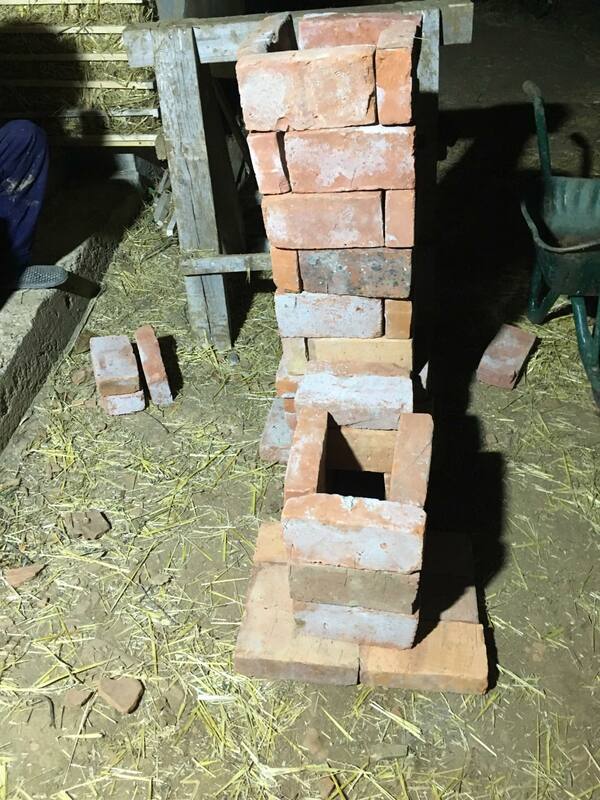 Getting proper materials to build the rocket stove was a priority, it can be dangerous to use regular bricks in the combustion chamber and not refractory bricks. DAY 3: The quest continues today, we NEED refractory bricks, and “something” to build the heat riser with (inner part of the barrel) to be able to reach our aim. 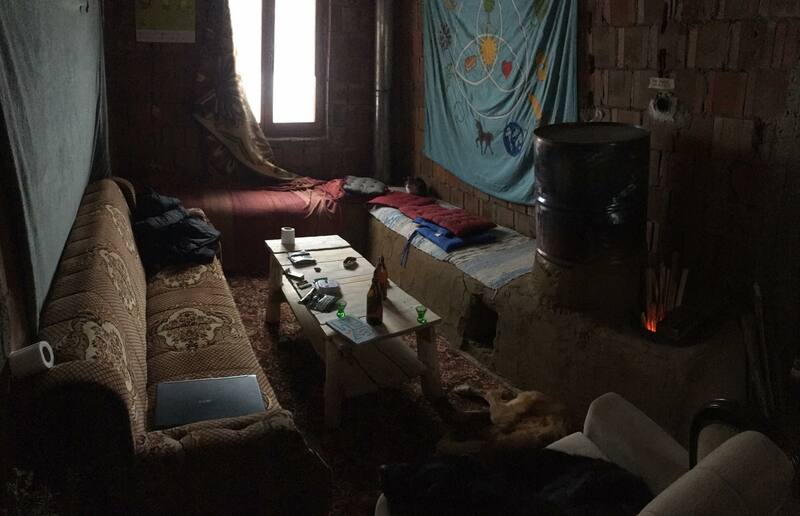 Today is a better day, we directly found a place to buy shamot pipe (for the heat riser, this is a high temperature cooked pipe made of clay and sand that is used in most of chimneys), and the owner directed us to an old Yugoslavian factory, bought a few months ago by someone that is dismantling it; a place where it is maybe possible to get second hand refractory bricks.. The combustion chamber is now ready to host the barrel, but it’s important to leave everything to dry in order to avoid moisture, the worst enemy for any kind of construction. The next days we will be building the brick tunnel of the thermal battery. 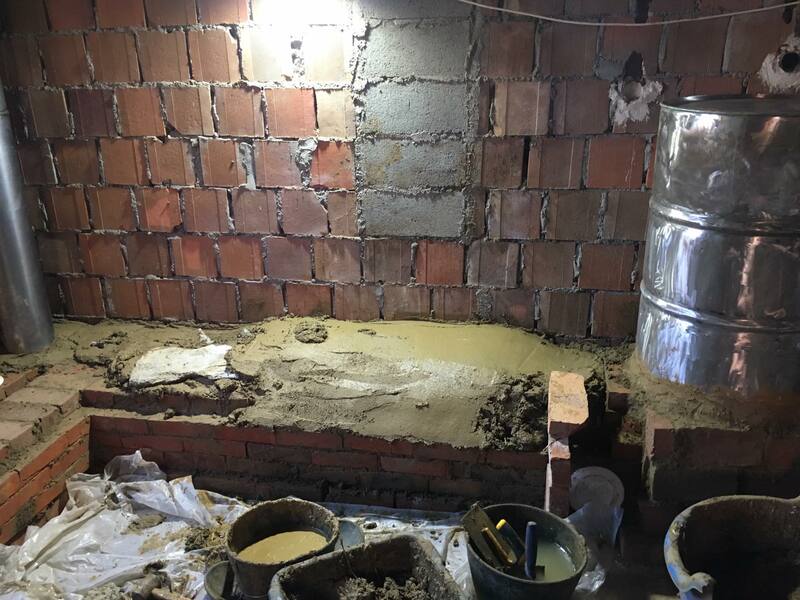 It is a long and hard process as it is masonry work close to the floor…. 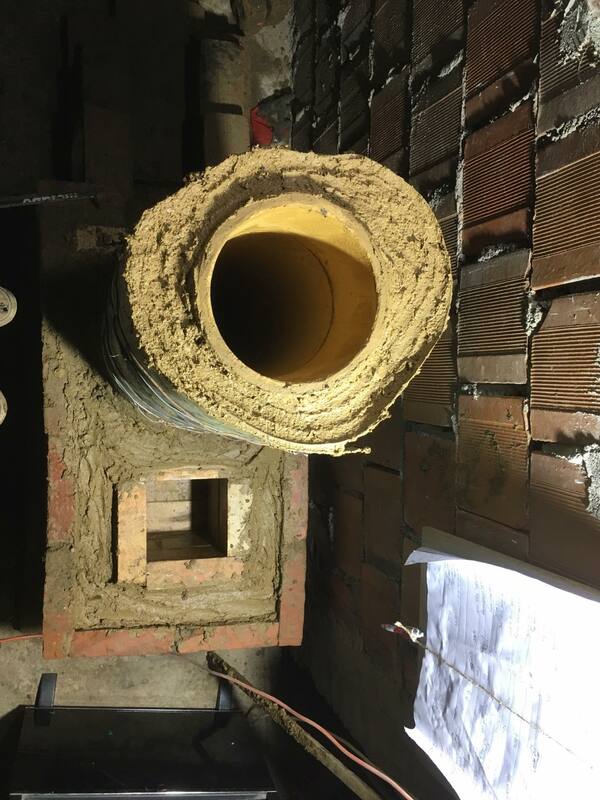 DAY 6: The chimney pipe has been settled up, clean out places installed. DAY 7: The barrel has been sealed, tunnel closed and the stove pipe is leading the smoke outside. The test fire has been a success! It is now time to cover the bench. It’s been now three months that the RMH is burning and heating the house. It works perfectly and fits the space really nicely. Our animals are enjoying as much as humans to sit/sleep on the bench on cold winter days. It’s been really interesting to build this, and to be honest I cannot wait to build another one! Believe me, you can build it also. We managed to build it with a budget of only 250€, only for materials.